Stephen Sutton captivated a whole nation with his fundraising for the Teenage Cancer Trust – all while going through his own battle with bowel cancer – and his death on the 14th of May has affected thousands of people who followed his story online and in the media. Diagnosed at just 15 years old with terminal bowel cancer, he spent the rest of his teenage years raising money for others who were also suffering from cancer. One of his quotes – which will no doubt go down in history – has touched an incredible amount of people, both in the UK and the world over: 2I don’t see the point in measuring life in terms of time any more. I’d rather measure life in terms of making a difference." Hailing from Burntwood, more than 11,000 people attended his vigil at nearby Lichfield Cathedral to mourn his death, but also – more importantly – to celebrate his life and his amazing achievements over the last few years. On Thursday 29th May, Stephen’s body arrived at the cathedral to applause from all of the onlookers, and at 11am (at the strike of the 11th bell), everyone put their thumbs up to emulate his trademark pose whenever he was photographed in hospital. 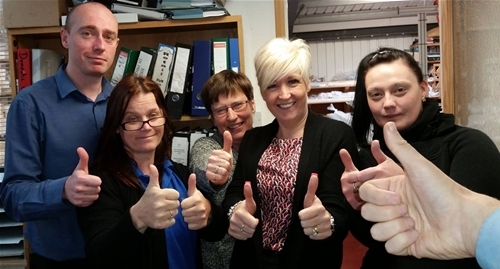 Pictured above, the Haywoods Blinds team (who are local to Burntwood where Stephen was from) are just a few of the thousands of people who ‘put their thumbs up’ in memory of Stephen; members of the public from all over the country have taken part in the Thumbs Up message which took over social media with the hashtag #ThumbsUpForStephen and featured hundreds of photographs of people from all walks of life putting their thumbs up for the camera. This “thunderclap” on Facebook and Twitter shows the true extent of the love and respect Stephen gained, with celebrities such as Jason Manford and Ricky Gervais also putting forward their own views on the wonderful life of Stephen and paying their respects to a national hero. So far, the total raised by Stephen for the Teenage Cancer Trust has reached an incredible 4 million pounds, which is even more impressive when you realise that Stephen’s original fundraising aim was just £10,000. If you wish to do something positive in Stephen’s memory, the charity can always use more donations to help others like Stephen in the future, and his fundraising total is expected to continue rising even after his death.